As the father of two little boys, I’ve changed thousands of diapers in the last three years, but never diaper jeans. Apparently, I’m missing out. The owner of a copyright in certain diaper jeans sued Kimberly-Clark, which sold jean diapers. Kimberly-Clark moved to dismiss the claims because the alleged designs were not substantially similar, and prevailed. Pollick v. Kimberly-Clark Corp., Case No. 11-12420 (E.D. Mich. Sep. 23, 2011). The Court stated, “Perhaps frivolous, Plaintiff’s complaint was plainly objectively unreasonable,” and granted Kimberly-Clark its attorneys’ fees as well. Images of the plaintiff’s and defendant’s diaper designs are below. First, the color of the diapers: Plaintiff’s diaper comes in two colors, white or light blue; Defendant’s comes in one color, dark blue. 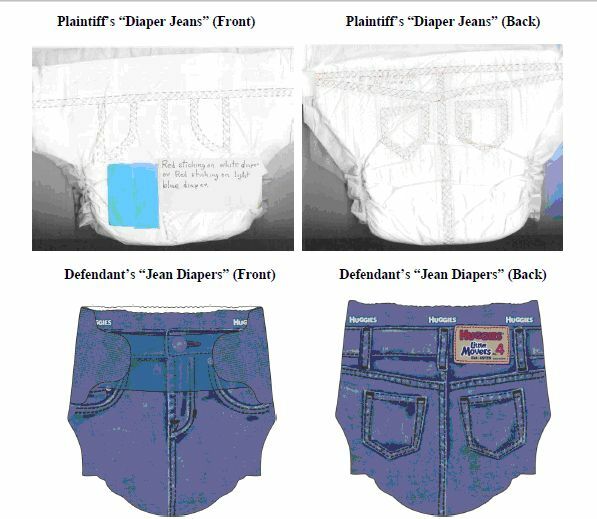 Second, the pattern of the diapers: Plaintiff’s diaper comes in two patterns, flat white or flat light blue; Defendant’s comes in one pattern, distressed blue denim. Third, the color of the stitching: Plaintiff’s diaper has red stitching; Defendant’s has either black or gold stitching. Fourth, the front pockets: Plaintiff’s diaper has two pockets, indicated by a straight line and a curved line; Defendant’s has three pockets, the larger two pockets indicated by a single curved line and a rivet at the top, and the third, smaller pocket inset within one of the larger pockets and indicated by a gently curving line and a rivet at the top. Fifth, the front fly: Plaintiff’s diaper indicates the fly with a single straight line (with no button); Defendant’s indicates the fly with a straight line and curved line, a button, and thicker hashed lines representing reinforced stitching. Sixth, the front belt loops: Plaintiff’s diaper has none; Defendant’s has two, one above each larger pocket with thicker lines representing reinforced stitching. Seventh, the back belt loops: Plaintiff’s diaper has none; Defendant’s has three with thicker lines representing reinforced stitching. Eighth, the back label: Plaintiff’s diaper has an embroidered “Diaper Jeans” on the left side of right pocket; Defendant’s diaper has a patch with “Huggies® Little Movers EST. 1975” above the right pocket between the belt loops. And ninth, the back waist: Plaintiff’s waist is indicated by a single straight line and single v-line; Defendant’s is indicated by a double straight line and v-line. The above contains considerable factual analysis at the motion to dismiss stage. Under the Twombly/Iqbal standard articulated by the Supreme Court, to survive a motion to dismiss, a complaint must allege facts that are facially plausible. Here, a picture is worth a thousand words (actually, 272 in the quoted section). You be the judge. For businesses facing a copyright infringement suit, this type of ruling helps pave the way for efficient resolutions of copyright disputes at the pleading stage. Many judges, however, would not rule at such an early stage of the proceeding, preferring to allow the litigation to play out to a greater extent, including discovery. This judge had no such qualms and clearly saw this case a certain way. Phillip Barengolts is a partner with Pattishall, McAuliffe, Newbury, Hilliard & Geraldson LLP, a leading intellectual property law firm based in Chicago, Illinois. Pattishall McAuliffe represents both plaintiffs and defendants in trademark, copyright, and unfair competition trials and appeals, and advises its clients on a broad range of domestic and international intellectual property matters, including brand protection, Internet, and e-commerce issues. Mr. Barengolts’ practice focuses on litigation, transactions, and counseling in domestic and international trademark, trade dress, Internet, and copyright law. He teaches trademark and copyright litigation at John Marshall Law School, and co-authored Trademark and Copyright Litigation, published by Oxford University Press. Yes, they’re the same thing, but the parties insisted on their own names.